Chicken Filling: 2 lbs. Chicken Breast, GOYA Adobo to taste, 1/2 White Onion, 2 Tsp. GOYA Minced Garlic, 1/3 Cup Sour Cream. Sauce: 2 cans (26 oz.) GOYA Whole Tomatillos, drained, 3 GOYA Whole Jalapeño Peppers stemmed, 1 1/2 Tsp. GOYA Minced Garlic, 1/2 Cup chopped white onion, 3 Tbsp. chopped cilantro, 1 Tbsp. GOYA Vegetable Oil, 1 Tsp. 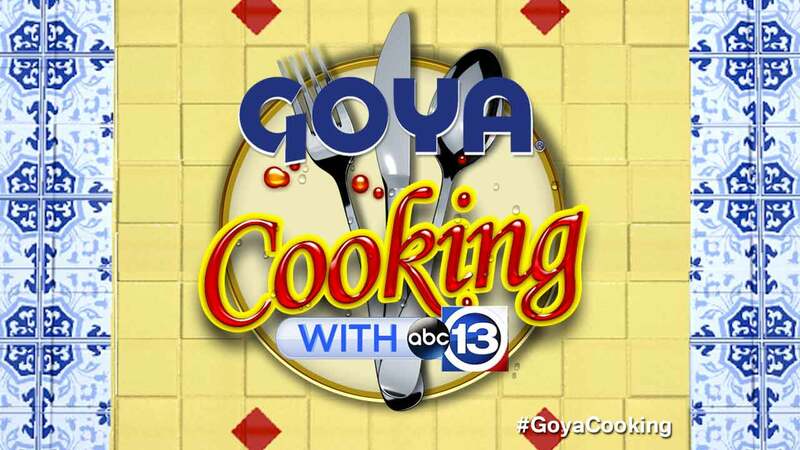 GOYA Adobo. Enchiladas: 1/3 Cup GOYA Vegetable Oil, 12 GOYA Corn Tortillas, 1 Cup Sour Cream, 1/2 White Onion very thinly sliced, 1 Cup Queso Fresco crumbled. -In batches, puree tomatillos, jalpeños, garlic, onion and cilantro in blender until smooth. -Heat the oven to 350 degrees F.
-In another small frying pan on medium-high, heat 1/3 cup oil until hot but not smoking. Using slotted spatula or tongs, quickly pass each tortilla through oil on both sides and drain on absorbent paper in single layer. -Using your fingers, dip each tortilla briefly in sauce, covering both sides. Place on plate, spread on large spoonful of filling and roll it up. Place in baking dish and repeat process for each enchilada. Cover with remaining sauce, cover with foil and heat in oven for 10 minutes or until enchiladas are heated through. Top with crema, onions rings and crumbled cheese. Serve immediately.